← SUPERGHOST’s Fright Week: F.E.A.R. Trick or treat Gears style! 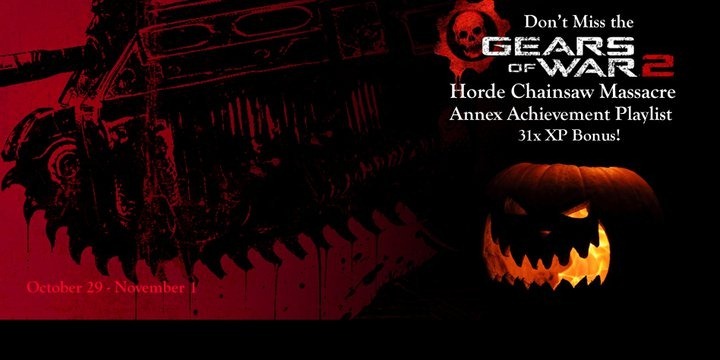 Gears 2 Gets Messy with Chainsaw Massacre XP Event! Our favorite horror films leave little to the imagination. Psychological horror is cool and all, but we on Gears prefer to rock Halloween the old-fashioned way: running, screaming, and a bit of chainsaw-inspired terror. Sound like your kind of fun? Then join us for this weekend’s Gears 2 XP event! From October 29 through November 2, XP earned across all multiplayer modes skyrockets to 31 times the usual amount. We’re also shaking things up with a special chainsaw massacre edition of Horde—Lancer-only matches with no more chainsaw interrupts to save your enemies (or you!) from certain gory evisceration. This sounds like it will be a lot of fun! I have been looking for an excuse to take a break from Halo Reach and get in some quality Gears play. What better time than on a fright-filled Halloween weekend! This entry was posted in FPS, Gears of War, Xbox 360. Bookmark the permalink.